South Korea maintains the top spot on average connection speeds at 21.9 Mbps. According to a report by Akamai Technologies, global average connection speeds increased from last quarter by 5.5% to reach 3.8 Mbps. The report also notes that amongst the countries ranked top 10, the average connection speeds for each of these is 10 Mbps. 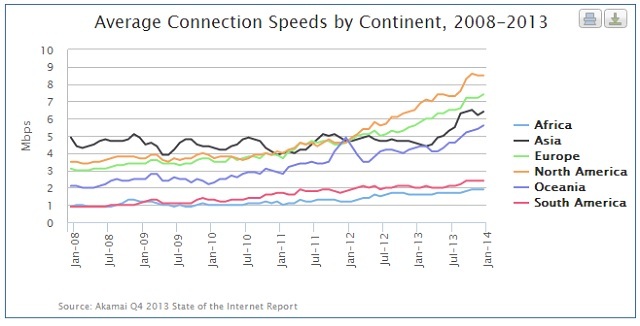 Average peak speeds were up 30% in Q4 2013 to 23.2 Mbps. Hong Kong had the highest peak average at 68 Mbps followed by South Korea at 64.4 Mbps. Global broadband adoption rates grew 27% in 2013. Attack traffic was up 43% in Q4 from China (which is 1st by source IP), the US follows at 19% with attacks from Canada growing by 10%. Attacks on port 445 grew 30% followed by port 80 at 14%. Port 443 maintained 3rd place, although attacks fell to 8.2% compared to 13% in Q3. 2013 also saw an increase in DDoS attacks by 50%. Nearly half of this attacks targeted the Americas with enterprise and commerce installations taking the most hits at around 70%. Organizations which suffered an initial DDoS had a 35% chance of suffering repeat attacks according to Akamai’s report. Though all Continents have exhibited huge growth over the last six years, Africa still lags with an average connection speed of 2 Mbps compared to North America which is averaging at almost 10 Mbps. The highest growth was experienced in South America and Oceania with 167% growth while North America closely behind with 140% growth. Africa grew at 110% over the same period. Asia remains peaked with minimal growth at just 30%. Asia has some high scoring countries like South Korea, Hong Kong and Japan with some of the highest average connection while China and India on the lower end.